People are outliving their money. More people than ever have reached age 100. Children helping mom and/or dad are spending in excess of $2,000,000,000 per month nationally for their parents' support and medical needs. The loan is satisfied only when you have permanently left your home. No FINANCIAL obligation to you/your family. 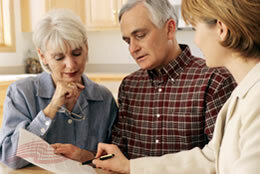 When you obtain a reverse mortgage you will be easing the burden your family would experience. Children are only too glad to assist mom and dad with their financial needs. Your children will have to put off putting money away for their own retirement and for their children's college education. *You must be 62 years or older to qualify for a reverse mortgage. Call us at 1-800-919-2682 to set up a no charge consultation.